Guided tours are the perfect way for groups of adults to explore the natural history of High Park with an experienced naturalist. Learn about the unique flora and fascinating creatures that call High Park home, including butterflies, birds, amphibians and mammals. 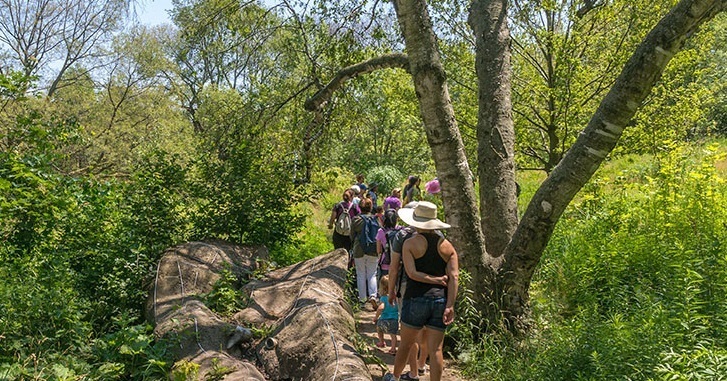 Hike through High Park’s natural ecosystems including the globally endangered black oak savannah, wetlands and woodlands to better understand this vital urban green space. Programs start at the High Park Nature Centre located at near the High Park Avenue main gates at 375 Colborne Lodge Drive (also known as the Forest School). Programs will proceed rain, snow or shine. Please remind all participants to dress appropriately for the weather as we will be outdoors for most of the visit. Programs may need to be rescheduled in the case of inclement weather such as heavy rain, thunderstorms, snowstorms, or high winds over 35 km per hour. If a program is rescheduled by the High Park Nature Centre, we will contact you at least 1 hour prior to your start time on the day of the program. If inclement weather prevents you from attending your program, we will do our best to reschedule your visit. Trails are generally moderate in terrain and difficulty. Please contact us to discuss accommodations that can be made in the interests of accessibility.